High water reportedly sent a black Chevrolet Tahoe off the right side of the roadway, making contact with a utility pole before going left of center and hitting a black Jeep Grand Cherokee head on. BRADFORD – High water on the roadway after heavy rain Thursday is believed to be the cause of a head-on collision. 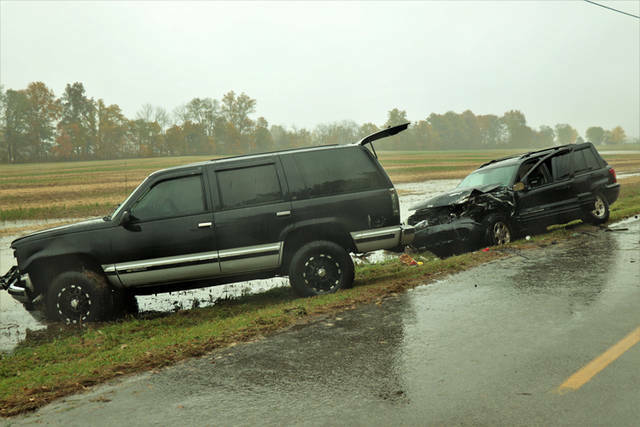 At approximately 2:35 p.m., emergency personnel from Bradford Fire and Rescue along with deputies from the Darke County Sheriff’s Department were dispatched to the area of 9303 New Harrison-Bradford Road in regards to an injury accident. 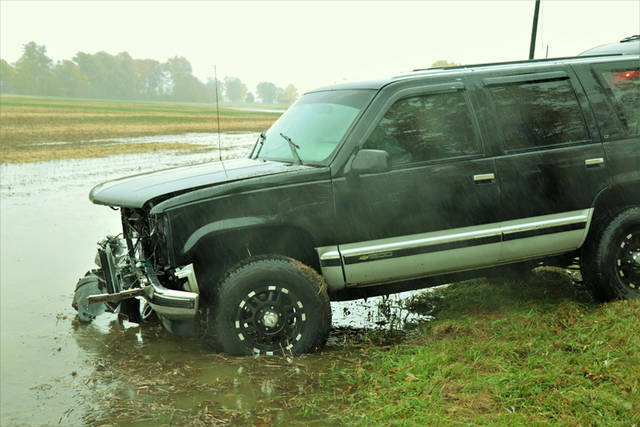 According to deputies on the scene, a black Chevrolet Tahoe was traveling eastbound on New Harrison-Bradford Road, just west of Smith Road, when the driver crossed through high water. The water sent the vehicle off the right side of the roadway, making contact with a utility pole before going left of center and hitting a black Jeep Grand Cherokee, traveling westbound, head on. The male driver of the Jeep and his female passenger were treated on the scene by Bradford Rescue before being transported to Upper Valley Medical Center for their injuries. The male driver, and lone occupant of the Chevrolet, was uninjured in the accident. Because of the high water standing in the roadway, authorities requested township personnel to the scene to place high water signs to further avoid any other incidents. This entry was tagged Bradford Fire and Rescue, Bradford Fire Department, Bradford Rescue, crash, Darke County Sheriff’s Department, Rain, Upper Valley Medical Center. Bookmark the permalink.